Lissadell: Memories of life in the 'Big House'. Following is an extract from the memoirs of Thomas Kilgallon, valet and butler to Sir Henry Gore-Booth of Lissadell House. It deals mostly with the numbers, duties and ranks of the servants and gives us a good indication of how a typical 'Anglo-Irish' family lived, not just in Lissadell, but in all such houses at the turn of the 19th century. It is instructive to reflect that the people who kept the 'gentry' in this lifestyle were the tenants who paid their rents for the privilege of living and farming on a small plot of land. Theirs was a subsistence lifestyle, their meals consisting for the most part of potatoes and stirabout with very little or no meat. "...Gentlemen’s houses at this period, and kept in the style of the Gore-Booths of Lissadell was kept had a house steward. Mr. Ball was house steward. He paid all expenses in connection with the house, both inside and out. That is such as repairs of buildings, inside or out. He engaged all the servants in house and stables, paid their wages, and dismissed them when necessary, ordered and paid for all wines. He waited at dinner, but not at other meals. He just handed round the wines. The groom chambers carved, and with the footmen waited at all meals, dispatched the post, opened all newspapers and ironed them, placed them in the rooms. Attend at the front door at the coming and leaving of guests. Attend at the door with the footmen when carriages were leaving. With the help of one or two of the footmen he saw to the polishing of all furniture in drawing or reception rooms. He seen to all writing tables, both reception and bedroom. He had full charge to see that the footmen done their work. There were three footmen, first, second and third... They were responsible for keeping all dinner silver in order, laying the dinner table and see that all plates, hot and cold, were ready for use. There was an iron cupboard outside the dining room, heated by charcoal. Footmen carried all dishes up and down from kitchen to dining room. They had help in washing up silver. All plates from all meals were washed in scullery by scullery maid. I usually worked with the under butler, but gave a hand with footmen also. I had no livery till after Mr. Gore married. Up to then I was like nobody’s child as I was wholly under Mr. Gore and he kept me busy looking after him, and his boat, fishing and shooting things. When there was a big dinner on, Mr. Ball, the groom chamber, three footmen, under butler, John Kerins and I, all waited. I was the only one not in full dress. The full dress livery had dark blue coat, red vest, red plush breeches, white stockings, and shoes with buckles. The footmen wore white thick cotton gloves at all times for dinner. The same number of men waited lunch if the house was full. Groom chambers and two footmen waited breakfast. There was no china washed up in the pantry. This was done by the stillroom maids. They also put breakfast and tea things ready for footmen to carry upstairs. They made all the different fancy breads as well as all the household bread. The housekeeper Mrs. Brown did not go to London. She stayed with the stillroom maids and made the preserves. There were two charcoal fires and a brick oven. I used to work here sometimes learning the baking. I remember the stillroom maid asking me to look after some of the bread she was making and not let them burn. I let them burn so as I would get them to eat. There were two stillroom maids, May McKay the head, Mary Ann Payne second, the first Scotch, the second from Munnianane a village near Grange. There were three housemaids and help. Their work was hard. They had to be up by four a.m. There was no hot or cold water laid on. They had to carry all upstairs. It was heavy work emptying baths. A great many fires in bedrooms, bathrooms and reception rooms. They also waited on ladies who had no maids. Servants passage: servants entered and exited the main building by this tunnel so they would not be seen from the windows of the Big House. The kitchen staff consisted of cook, pastry cook, kitchen maid, scullery maid and help when required. Kitchen boys whose duties were to light all fires, clean out ashes, scour all coppers, all cooking was done on coppers. Look after two boilers, one in top scullery and one in bottom scullery. From these boilers all the hot water for baths, washing up, etc came. Pump water to tanks on roof from well in scullery. The cook was a Frenchman called Friburg. He was fond of whiskey, and engaged George Grigg’s horse and cart to take him to Sligo one or two days in the week. George was known as the bleeder in those days. Bleeding and leeches were a cure for all diseases. George was supposed to be a clever cow doctor or quack, and also helped all people who asked his services. He lived in Munnianane. He was a nice kindly old man. They sat in a public house in Sligo till it was time for Friburg to see about dinner. There was such a great number of servants in the house and stables and guests andcallers, it took a great quantity of meat to supply all. It was more like a hotel. There was a sheep killed every day. A beast every two weeks. They killed and saved their own bacon. Most of the game from shooting parties was consumed in the house. There was none sold. What could be spared was given as presents. There was a great quantity of fowl, turkeys, geese and ducks eggs used. Mrs. Ball, the house steward’s wife, had charge of the fowl. She had a man and woman to help. Mrs Ball lived at Fairy Mount. There were several houses erected for the different breeds of fowl. There was a man, Pat Hack, came to the house each day for orders. If they came short of fowl or eggs, the man Hack went to the villages and purchased what was required. When I think back on what Lissadell was then, it would take volumes to describe. I forgot to mention there were no ranges in the kitchen, open fire place. There was a large iron screen in front of fire for heating dishes. The roasting of joints etc was done by a clockwork spit. There were two charcoal fires and what was called a plot plate, which is still there. There was a game larder in the yard. At one time they brewed their own beer and ale in one of the cellars in the yard. All the servants did not sit together for all their meals, only for the principal meal, dinner. The room servants or what the hall servants called it, with a sneer, pugs parlour. There were six livery men from the stables who had their meals in the house, about twenty-four servants sat down to the midday dinner. The house steward took the head of the table. The under butler the other end, as there were always two joints, one at each end. At other times such as Christmas there might be four or five joints. All the women sat at one side of the table. The men the other. The housekeeper sat on the left of the steward. The maids according to their rank next to her. Sometimes there would be quarrels if a second lady’s maid took the first maid’s place next to the housekeeper. The same with the men. At the ordinary meals in the servants hall in the absence of the under butler the head coachman took the head of the table. The house steward said grace and when all room servants had finished their meal, the others laid down their knives and forks, and the steward said grace. The housekeeper rising, the lady’s maids following, the steward taking up the rear, went to the stewards room for their next course, the under servants finishing their meals. The hall servants did not always get a second course. At meal times there was a wagon on wheels, with a large keg of beer on it, and several horns instead of glasses for drinking. The wagon passed up and down the table as required. Some of the men had private horns of their own with glass bottoms. And on many of them had engraved on the glass a man hanging on a gibbet, with the word underneath it, the last drop. Some of the horns were nicely mounted with silver bands, with their name or initials on a silver shield. There was beer served out to all the servants, both men and women, several times a day, at 11.00 a.m. dinner hour, 7.00 p.m. and again at supper. One pint each at the different hours. The room servants got ale, the groom chambers served ale, the under butler the beer. There came a cartload of beer and ale two days a week from Charles Anderson’s brewery, Sligo. Visiting servants, callers, keepers etc etc helped to drink part of this. Steward room servants had the same food as was served in the dining room. After coming from the dining room it was put on clean dishes, but not on silver ones, as the dining room. The steward’s room boy was in livery. He brought each course and cleared away. There was a bell outside the room with bell pull inside. He laid the dinner and supper table. The second stillroom maid laid the breakfast and tea table. The boy valeted the steward. He also laid the servants hall table for all meals, cleaned room and hall knives, polished the ladies maids boots. All ladies maids of the house, visiting maids, also had to dress with fairly low neck dresses. Valets had to appear in evening clothes. If you did not carry out all of those rules, your time would not be a pleasant one. Steward and housekeeper would make it very uncomfortable for you. At night there was whiskey and wines served. Usually, there was a small dance in the servant’s hall once or twice a week or three or four hours. They were allowed beer and a bottle of whiskey for punch. There was an old fiddler gave them music. 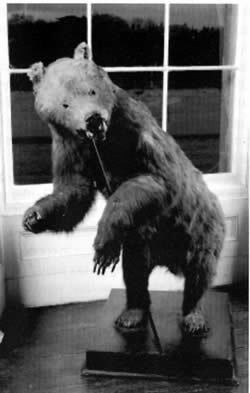 Stuffed bear shot on a hunting trip by Kilgallon. The bear had attacked Sir Henry. I often wonder where all the servants slept. I know there were three and four beds in a room. Many of the men had folding or press beds here and there in pantry and hall. As I wonder over where all the servants slept, I wonder more at the great quantity of clothes the footmen and coachmen and grooms got. There were four footmen, and John Kerins Sligo five. Each got one full dress suit which consisted of coat dark blue, red vest, plush breeches, six pairs of white cotton stockings, two pairs shoes with buckles. Six pairs thick cotton gloves. One working suit of tweed. Two livery coats, red vests and two pairs trousers. The coats of the morning or afternoon liveries are called by the tailor’s, coatees. One overcoat every two years, one top hat. Cockade plaid brown leather gloves. The stewards room or hall boy got the same, with the exception of the dress livery suit. The coachmen got two suits of livery, red vest, leather breeches, top boots, top hat, cockade, top coat, and brown leather gloves. There were three coachmen, one pad groom, and the boy they called the tiger. The huntsman and whisperings clothes were a dark green, red vest, black hunting cap, leather breeches, and brown gloves. They did not get top coat or top hat. There was a postillion jacket, silver gilt badge to be worn on arm. It was always kept in the house for safety. The footmen and coachmen wore their livery when going to church and when coming into the house on Sunday for night prayers. There were three laundry maids, and a man turned the mangle, drew water from the well, emptied the tubs, churned the milk for dairy maid, took milk to the house, mopped up the passages in the house on Saturdays. The laundry maids did not come to the house for their meals. They got their provisions once a week from the house. Beer daily brought down by the man, when he came up in the morning with the milk. The dairy maid, Mrs Anderson, was the steward’s wife, she had a maid under her. The steward just before I came was James Martin. He succeeded his father, James Martin, who was killed by falling from his horse just below Fair Mount. It might be from a heart attack. All the laundry maids were local, Biddy McLean, Mary Battles, Mary McLean. The butcher who I served my butchering to was Phelim McMorrow. He lives behind the engine house. I remember when he put the knife into my hand after seeing him kill a sheep. He told me do it in the same way. When I stood over the sheep I fainted. When I recovered, he caught hold of my hand with the knife and put it into the sheep. It was awful. Poor innocent thing who ever resists. We used to kill pigs and skin some of them for saddles. Killing a best was a terrifying business. The best was tied round the horns. There was a ring, which was fast in the floor. Several men pulled on the rope until the beast’s head was brought down to the ring. The butcher then hit it with his force on the forehead to kill it. It was cruel. At one time when he failed to stun or kill it, it got out of the slaughter house. It ran mad into the wood and had to be shot. 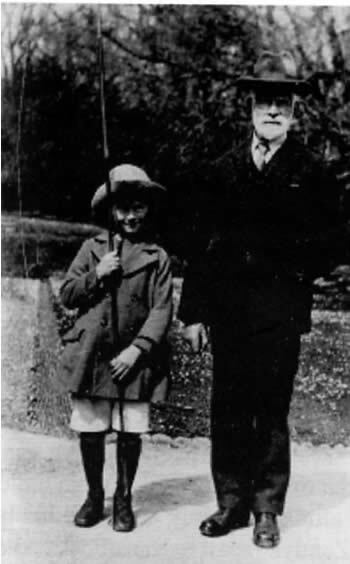 They kill them in all places now by a painless process..."
Right: Thomas Killgallon c.1925 with Angus, Sir Henry Gore-Booth's youngest grandson. Lissadell: Memories of life in the 'Big House' Part 2 cont. …Sir Robert built a yacht at Lissadell in a laneway near the farmyard. The builder was McCarrick of the Riverside, Sligo. He had her built for racing. She was christened by Mrs Doctor Hamilton, and called the Garand. The family were in London at the time. When she was fitted out, her captain or skipper came from Cowes with another man as part of the crew. The remainder of the crew came from Rosses Point. I was asked to go with her as far as Kingstown as Cook. She was found for Southampton. Captn C. Wynne was in charge. The builder was on board. Captn. Wynne’s servant acted as steward. They were to engage a cook at Kingstown. I was to teach him to make bread and then return home. We left Rosses Point about 11.00 a.m. There was sailing breeze. Later the wind freshened. After we passed Rockley, between it and Donegal, Capt. Wynne was steering. I was sitting near the bow and watching the mast. Capt. Wynne noticed me. He said what are you watching, Tommy. I said the mast, Sir, it is bending very much. He laughed. Just then the mast broke, and part of it with all the sails fell, some on deck, others into the sea. The part of the mast that feel had what is called the cross tree on it, that is a heavy piece of iron. It fell close to me, and pierced the deck just over where one of the men was sleeping in his berth. It was only inches from his head. He had a miraculous escape. Here we were in a very dangerous position with a heavy sea running. The first thing to do was to get the sails and ropes out of the water. This done, there we were with more than half the mast standing, just the bare pole without a sail. The mast broke under the part where all ropes are made fast. They call it the hounds. The mast was of course new and freshly oiled. Could a man shin up it and fix a strap one block there. Several tried. One man named Gaffney, a very strong athletic man, succeeded. Fortunately the wind was in our favour, north west. We got the square sail up, and steered for Rosses Point, which we reached late in the evening, and made fast to a large ship anchored there. It was nearly a week before we got a new mast fitted, and sailed again for Kingstown. … Sir Robert had good sight, although his legs looked very weak and inflamed. They looked as if he might be suffering a deal of pain from them. He kept wiping them very often. Sir Robert was a small man, slightly round in the shoulders, very quick in speech and movement, fond of company, especially that of ladies. If one may form an opinion from hearsay you would say, or rather come to the conclusion, that he was not a saint. Judge not lest you may be judged. He was a good landlord and lived most of his time on his estate, but left the management of it to his agents. He had one especially whose name will go down for all time as being one of the worst of agents, and it would be well if Sir Robert had never had him, for the good name of the Gore Booth family. His name was Dodwell. He was related to the Gethins of Ballymote by marriage. It was a common report he was the prime mover in the Gore Booth family losing by fraud part of the Ballymote Estate. I never heard any of Sir Robert’s family calling him by the name of Father, Papa or Pa, Da. When I say never, I did once hear Miss Stella calling Papa. It was always your Honour. It was by visitors, I mean guests. It was always what does your Honour think etc. Sir Robert himself when refusing or sanctioning anything he usually mad use of the words upon my honour. I will or upon my honour I won’t. Mrs Usher always called him by a pet name, Bumbles. Sir Robert when hunting did not wear top boots. He always wore jack boots. They came a little above the calf of the legs, then pointed towards the knee. … How the present Sir Josslyn when a baby was nearly drowned: on a very hot summer day his nurse a Mrs Goe carried him onto the sandbanks in front of the steward’s house, the day being hot and the sand dry and warm. She was tempted to sit down with the child in her arms. She may not have known much about the tides and how quickly they come in. After enjoying the scenery for some time, she fell asleep. John Kilgallon, skipper of Capt. Wynne’s yacht was after coming on dock and having a look around. He noticed some unusual heap on the bank, being a good way from him and not moving he wondered what it could be. It was surrounded by water and the tide running in very fast. He took his boat and rowed towards it. When he got near it, he saw it was a woman. He shouted, got out of his boat and walked towards her. When she got up with the child in her arms, she was terribly frightened. They were not wet as the tide had not reached. If it had and she waking up in a fright, she might have faced towards the channel and got lost. Kilgallon brought them both ashore, none the worse for their outing. The nurse left soon after. Then came a Mrs Clarkson, who nursed all the children. Sir Josslyn will remember her. Poor thing, she died from cancer on the breast which she kept concealed too long. Dr. McDowell said she could have been saved if she had made it known two years or so earlier. She was a nice gentle woman. … Mr. Arthur Kavanagh, the gentlemen without legs or arms, came to Lissadell once. He and Mrs Gore were great friends. He was from Borris Co. Carlow. Mr. Gore I think met him first at Adare Manor when visiting there. He was a wonderful man in many ways. He had no arms or legs. His arms just two stumps as if they were cut off midway between elbow and shoulder. From above the knee he had no legs. For dress he wore an easy fitting smoking jacket and waistcoat, tie and collar, heavy cloth skirt strapped round his body, the waistcoat long enough to hid the buckle of band of skirt. When sitting down you would not notice there was anything wrong. He had a broad, full face, of heavy build, would weigh about twelve or fourteen stone, and did not care to be stared at. Mr. Gore told me this before he came. He always sat with Mr. Gore in his study till mealtime when his servant carried him to the dining room. His servant cut up his meat and laid his plate before him. He could hold his fork with the two stumps and feed himself, hold his glass. He could hold the smallest article. At times when I went into the study he used to talk to me on navigation. He had quite a short pencil. He would draw circles in describing the globe. In writing a letter I did not see him but I think he held the penholder in the mouth and guided by the stump. He had his pony with him. He rode about the grounds. The saddle was formed like an armchair, the reins and whip strapped to his arms. He travelled a good deal with younger with his mother. He married his cousin. There are several children of the marriage. He kept a pack of hounds and hunted with them. He kept a large yacht called the Eva, after Miss Eva Gore-Booth. He was a Member of Parliament for Carlow and sat in the House of Commons. His servant carried him to his seat. He was a good fisherman. I think it was with him Mr. Gore went first to Norway and fished the River Paving. The fishing reel was specially constructed for his use. I remember we were staying with the Marquis of Ormond in Kilkenny. In the picture gallery or ballroom there were a good many chairs placed in a row around the room. When Mr. Kavanagh was sitting he wriggled himself from one chair to the next to get a view of something he was interested in and did not wish to call anybody’s attention. From practice he could bring his two shoulders close together in front of his chest. One morning I was standing in the front hall. Mr. Kavanagh was being carried downstairs by his servant. Just as he got to the bottom, and on to the uncarpeted floor, the man slipped up and Mr. Kavanagh was thrown to the ground. He rolled along the floor a few times. I was afraid he was hurt. I went to lift him. He only laughed. The servant had him on his back again. He was a strong man. He was one of the crew of his yacht and was with him for many years. I think Mr. Kavanagh was Miss Eva Gore-Booth’s godfather. … In eighteen seventy-six Sir Robert’s health began to fail. He was at home during the winter. He had the steward of his yacht as valet, his name Forsyth. Mrs. Usher was most of that winter at Lissadell. During December sir Robert got bad turns. His man used to take him from his bedroom to drawing room in a wheel chair. Mrs Usher kept him company. Later he did not come so often to the drawing room, as some nights he did not sleep much. Many mornings Forsyth was unable to get down at the breakfast hour, and had to have cold breakfast. One morning at breakfast in the room, I asked the cook housekeeper if she could arrange to have Mr. Forsyth’s breakfast kept hot in the kitchen for him, as a man sitting up most of the night in a sickroom did not relish a cold breakfast. She picked up the plate she was eating off, and with all her force threw it at my head with the exclamation ‘take that you Popish brat’. It did not hit me as I dipped my head, but it broke on the wall behind me. She was Mrs. Jones, a Welsh woman. She had a most violent temper, and never looked at you straight. The others in the room congratulated me on my safe escape from a split head. At Christmas one of the Scotch Miss Gore-Booth came on a visit from her married sister’s place in Liverpool, where she must have contracted fever. The day she came, she was sitting in the drawing room with Sir Robert and the others till dressing time for dinner. I was holding open the swing door for Forsyth, who was wheeling Sir Robert into his room. Sir Robert said goodbye till dinner to Miss Gore Booth who was wailing by the side of the chair. She said goodbye. I will be down soon. After she went to her room she got very ill. She did not come down. The doctor was sent for, and pronounced it fever. 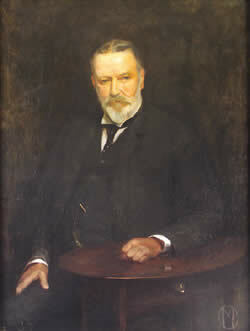 Sir Robert took ill and died that night and Miss Gore-Booth died next day. It was tragic. … Christmas week in the house was a crowded house. Every room in house and bachelor’s quarters were occupied. It was a time of feasting and pleasure. Plays and music at night, hunting and shooting during the days. I wish I could describe it all as I saw it. All the sideboards in dining room loaded down with the different meats, boars head with an orange in his mouth, game pies, boned turkeys, roast turkeys, ham, round spiced beef, etc. Laughter and song all the day long with the ladies and gentlemen. Gentlemen stayed up late at night playing billiards and drinking heavily. Getting drunk was a common thing, and nothing thought of it. Yet at the time there was nothing ungentlemanly occurred. Rarely you would see any of them under the influence of drink during the day. At night they dined well and drank well. The amount of drink consumed was unthinkable, both whiskey and wine. Port and Madeira, Champagne of the best vintage. The bill must have been heavy for the Christmas week alone. It was about Christmas time I once got a great fright. There was a big dinner on and a dance to follow. As it was getting near the dinner hour, it was found the Under Butler was not in the house, and as he was responsible for having everything ready for dinner, everybody was getting uneasy, as he had the key of the plate closet with him. However at a short time before dinner he arrived. As I usually worked with him, he began to work with all haste, and handed me the key to open the plate closet. The lock was stiff and when opening it I noticed he always took the poker and put it into the ring of the key. I followed his example but, unfortunately, turned the key the wrong way, thereby twisting the ring off the key. When I had seen what I had done, I simply ran out of the house and into the wood with fright, expecting every moment I would hear of the police being after me. As my bedroom was in the stables I went to bed. The blacksmith was sent for. He got the key out. Dinner was very late. The steward blamed the under butler. His name was Stephens. He married Anne Regan, a relation of the Maxwell’s, they lived in London. … After Sir Robert’s death, Sir Henry and Lady Gore-Booth visited a good deal, in Ireland, England and Scotland. One year Sir Henry was shooting at Adare Manor. Her Ladyship was not with him. The first night we slept there a strange thing happened. My bedroom was a large room, no furniture to speak off, just the one bed. There was a good-sized oil painting on the wall over the door. It would be in the early morning, I woke up with a feeling there was some person near me. I could see nothing. The room was dark. I have no recollection of lighting a match. I don’t think I did. I was too much afraid. I never felt anything like it before. It was something one could not describe the feeling. I think I must have lit a match, as I had a feeling the picture on the wall had something to do with it. The cold perspiration I could feel on my face and body. When I came to the room for breakfast I thought those in the room looked at me as if they expected to hear something. I began to tell them of experiences of the night. Yes they told me it was a haunted room. Just before I slept in it there were two maids who had to leave it. After I had my breakfast I called Sir Henry. The first question he asked was what do they call this room. I said it’s called the white room. Why he asked me. There was a white or rather lady in white stood over me in the bed last night I said. Then I told him of my experience of the night. Neither of us spoke of it again. I was put into another room, on the tower, away from all civilisations as it were. I need hardly say I did not enjoy my stay at Adare Manor. They paid all visiting valets who waited at dinner 10/- a night. 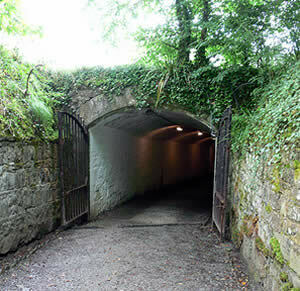 … When we got to Manorhamilton Sir Henry engaged another car to take us to Glencar, where his own trap would meet him. We were not long on the road, when the shooting of Lord Leitrim was mentioned again. Sir Henry asked the driver what the people around Manorhamilton thought of it, as Manorhamilton was part of Lord Leitrim’s Estate. Sir Henry asked the driver himself what he thought of him. “Well your Honour, hell would not be full if Lord Leitrim was not there. He was devil on earth. He brought ruin and misery of many of his tenants by rack rent, and worse still he ruined many a girl who took service in his house. And what I have told your Honour is true”. 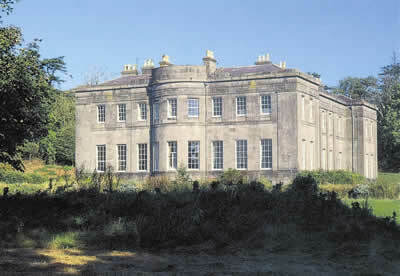 Lord Leitrim stayed at Lissadell the night before he was murdered. He was a big powerful man, aged about seventy years. He was lame. His servant man was an also a big strong man. His Lordship rode in close carriage, it was said it was bullet proof. His man followed behind in a car with the luggage. There were no motorcars then. He was fired on from behind a fence. He jumped out of his carriage to face the murderers when he was knocked down and killed. His servant had his pistols in his car. He saw the attack, but could not get near to give assistance. It was said the servant’s car driver refused to drive when he saw the scuffle on the road. … There is one thing I do not forget. My toothache, the first. There was no dentist nearer than Doonally which was three miles, but there was a blacksmith who they told me was quite good, and often took out teeth. It brought my mind back to George Grigg of Munninane, who obliged people by bleeding them. I took up courage and saw him. He said he often took out teeth, and found no difficulty in it, so I sat for him and he drew it successfully, and gave me a glass of raw whiskey to wash out my mouth with and the charge was 1/-. … A most amusing thing happened one day at the front door of Lissadell House. Lady Gore was standing on the steps seeing people off. There was an old woman standing on the top step. Lady Gore recognised her as she often had seen her in the kitchen selling fish and she thought her name was Fish. Lady Gore turned towards her and says well Mrs Fish what do you want. My Lady, I am not Mrs Fish. My name is Mrs Mannion, wife of Mr Paddy Mannion, a decent man and I have as much right to be called Mrs Mannion as you have to be called Lady Gore. Oh, Mrs Mannion, I am so sorry, I thought your name was Mrs Fish. Of course you have as much right to be called Mrs Mannion as I have to be called Lady Gore. Well, Mrs Mannion, what is it do you want. I did not hear the reply. Mrs Mannion’s husband was rarely ever sober, but Mrs Mannion like a true wife always took his part. Lady Gore often had a hearty laugh over this. … Sir Henry introduced roe dear into Lissadell, the first of its kind, I heard it said, into Ireland. The first five came from the Earl Minule as did three other lots. The first five died. Of the second five: one lived. The third five: all lived. Out of the six living, there grew up quite a lot. They were nice to look at. Some days in the early morning there would be quite a lot in front of the drawing room windows, at the least sound they got startled and were off. They grew to be much larger in body and the size of their antlers than those in Scotland owing to more richer feeding ground. Many of them wandered to the Mountain Plantation, Markree and Ballintrillick, and on towards Lurganboy. There were a few shot each year as required. As years went on they grew so numerous that they became a pest to the new plantations by nipping off the leading shoots of young trees. It was decided to have a big drive and weed them out. It was some years before the last of them were shot. Lord de Grey was at that shoot. He was quite pleased with the number he shot. I think it was at Mancaster Sir Henry met Lord de Gray and was invited to Lissadell each year afterwards for the woodcock shoot. Lord Mancaster was also at the Lissadell woodcock shoots which shoot they enjoyed as the woodcock is considered a most difficult bird to shoot and they are not very numerous in England. Sir Henry shot at Stadley Royal for many years, a shoot which he enjoyed more than any other of the season. There was one particular drive of highflying pheasants over Fountains Abbey. On the day this shoot was held all Ripon well to do people turned out to see it. It was called the Gallery by Lord de Gray and he had great difficulty to keep them at a safe distance and not interfere with the guns. As a rule they were all good shots that were invited for this shoot. Sir Henry was considered a first class shot and the Ripon people seeing him shoot for many years always tried to get near him and Lord de Gray. Yorkshire people, they say, are keener on all sports, more than any other country in England. Whenever Lord de Gray brought down a high bird, you would hear the exclamation all round. By gum, that’s a rare good shot. A similar exclamation when Sir Henry did, you see that one: ‘that’s Gore-Booth the Irish man, he’s a rare good shot’. Studley Royal shoot was a wonderful shoot, for the great member of pheasants, fourteen hundred in one day not to speak of all other such as hares, rabbits, an odd woodcock or two. This would be for one day’s shoot. There would be four days, each day with some hundreds of pheasants and other birds. I have spoken of Lord de Gray. He was the only son of the Marquis of Ripon. He gave the arrangements of the shoot to his son. The Marquis was also a good shot but getting into years. He gave the principal stands to younger men. The Studley shoot was a bachelors shoot. I only saw the Marchioness there once, and Lady de Gray twice. She was thought very beautiful. They reared a great quantity of pheasants; they had a great number of keepers. They had extensive grouse moors. They were driven to the Butts by hundreds of men with flags and sticks, and shouts and booing to keep the birds forwards to the guns. Its nice work driving the birds. There is a keeper placed here and there to keep order and proper line. The house itself is not much to look at. There is a good deal of tapestry work in the drawing room. There is what they call the high stable, a large room or hall, with two fireplaces, one each end of the room, a large mechanical orchestra. The place is like a mess room. Stuffed wild animals of all kinds, skins, birds etc. After the days shoot the gentlemen go there till dressing time. Drinks of all kinds are kept there. The household staff is something after Lissadell, but not quite such a large staff. There is a clear view from Studley Park to Ripon Cathedral. The Marquis was building a large church in direct view of the Cathedral. When half built he became a Catholic, but finished the church for the Marchioness and built a private chapel for himself attached to the house, with a door leading from his bedroom into it. The priest came each morning from Ripon. He served Mass himself. Some of the village people could go to mass there. Both the Marquis and Lord de Gray were of hasty temper. The Marquis was at one time Viceroy of India. There were some Indian articles of various kinds. Lord de Gray shot a large number of lions and tigers and many other wild animals. The Marquis had another estate in Lincolnshire called Nocton. It was within hearing of big Ben of Lincoln. Sir Henry went there once for partridge shooting. The new butler for Lissadell was Mr. Bailey. He was first footman at Muncaster. He was fond of sport of all kinds, principally cricket. He was rather a good left hand batsman. He had rooms for his wife at the stables. … We stayed at Markree Castle twice for pheasant shooting. The birds were very tame, must like ordinary fowl, came and picked at the shooter’s legs. In England where they rear many birds they are shifted from one place to another to make them wild. To do this you must have covers a good distance apart. Markree Castle is well built. There are some fine rooms in it. Col. Cooper was a collector of old clocks, there was a clock in every room in the house, and a room where there were dozens of clocks. Mr. Nelson of Sligo stayed there for a week or two each year cleaning them. The Colonel was very stingy over fires. The servant department was allowed only one scuttle per day. There were constant rows amongst them as they stole from each other. Mrs Cooper on the other hand was more liberal. The Colonel would not allow her to have anything to do with the coals. Sir Henry never felt warm there. He put his coats on the bed to keep him warm. Lady Gore was not with him. The Colonel was a tall thin man with side-whiskers. Mrs. Cooper was not very tall but very stout, shallow complexion and very dark hair, fond of jewellery, as were her three daughters. Mrs. Cooper dressed for dinner in yellow, with amber necklace and bracelets. Neither the Colonel or Mrs Cooper were popular. … The death of Mrs Owen Wynne cast a great gloom over both Hazelwood and Lissadell, especially owing to the sudden and tragic way in which it happened. On a Sunday afternoon Mrs Wynne and another lady Miss Mansfield were making an afternoon call on a gentleman who was living at what is called the Courne. I forget his name. He was Army Captain. They drove in a small low four-wheeled trap, with one pony. It would appear in going down a steep hill the front of the trap touched the pony’s legs. He took fright. Mrs Wynne guided him safely for some distance. There happened to be a heap of stones well on to the road, where a farmer let his cattle into a field. The trap hit this and both ladies were thrown out. Mrs Wynne must have held on to the pony’s reins and was dragged some distance. She got badly hurt about the head and face. She was taken into an inn close by. The doctor was sent for as was Mr. Wynne. She never gained consciousness. She lived till next day. The gentleman who they were to visit rode to Lissadell. It was about the hour or twelve or one o’clock when the bell rang. I was not in bed at the time. The big doors then were always kept closed. When I got there, the person kept hammering excitedly at the door. I asked who was there. He answered excitedly, Kilgallon, please open the door quickly, a terrible thing has happened. I knew his voice, as he was a constant visitor. I woke up Sir Henry and told him the sad news. He told me to order a carriage at once. Her Ladyship went with Sir Henry. Mrs Wynne’s death caused great sorrow in the whole county. Mr. Wynne was heartbroken. He gave orders that nobody should see her face as it was then. They would remember her in her beauty. She was very pretty. Of her children, Miss Dorothy resembled her. Miss Mansifeld was not much hurt, but was badly shaken, and heartbroken. Mr and Mrs Wynne were always very popular. They were very good to the poor. I went to Hazelwood next day, and we remained till after the funeral, which was very largely attended by rich and poor of all creeds and classes. Mr Wynne never got over his great loss, that free and jocular manner which he had never returned. He was like a schoolboy in his manner, fond of a joke. Mrs Wynne was buried in the Sligo Cemetery on the 7th or 8th March 1887.